If you’re like most busy travel pros you’ll find that trying to add one more thing into your daily mix is beyond a chore – it’s pure insanity. Those that have recognized the benefits of social media seem to have endless time to just “hang out” on Facebook, right? Like all new skills we learn, the trick is to incorporate the training into the day to day. I won’t go into the pros and cons of social media here – suffice to say it’s where your customers are, and so it’s where you need to be. I’ll simply ask you this: your clients and referrals are making friends with your competitors and learning about what they do – shouldn’t you be there too? Let’s assume you’ve moved past that stage for a moment and you’ve embraced the need, and maybe even perhaps the opportunity of social media. You’ve opened a Facebook account and maybe even created a page for your business. Now what? Let me introduce you to a couple of products and services that will help you manage and master your social media time and keep your page from languishing, or help keep you from becoming a Twitter Quitter. HootSuite is a web-based program that lets you see and manage all your social media accounts in one place, so you can see at a glance you Twitter feed, Facebook personal wall, and any Facebook Fan Pages you’ve created. It also connects with LinkedIn and Foursquare if you’ve really taken the plunge. Co-Authoring: Social Media is time consuming, there’s no doubt. It’s hard to keep up and participate in all the conversations happening. Smart companies are embracing the benefits of co-authoring accounts, meaning more than one person has access to post. With Hootsuite you can see and manage co-authoring without giving over complete access and control to the main account, and you can revoke it at any time. You can also see who has posted what, and when, so there’s no overlap. Scheduled Tweets and Posts: In the Social Media course I teach called TravelGeekSchool, I cover the basics of how to create a social media plan. One of the cornerstones of all social media plans is consistency. HootSuite becomes a key to that consistency through its use of Scheduled Tweets and Posts, meaning you can set up tips in advance and they automatically post at the time you set. For example, one of my clients has a daily post of “did you know” facts about the travel industry. Rather than remembering to do them every day, she sets up two week’s worth at a time and then her work week isn’t interrupted with trying to “do” that social media thing. It’s less of a chore, and more of an incorporated process into her workflow. She can also tailor the Facebook message differently than Twitter, since they’re different audiences and allow different numbers of characters. Monitor Keywords and Search Terms: One of the biggest opportunities in Twitter is to find existing conversations or needs, and then filling those needs. With Hootsuite you can create search terms and eavesdrop on those conversations. It’s how the larger companies are proactively finding disgruntled (and verbal) customers, and showing the world watching that they care and fix the problem. There are literally dozens of other tips and tricks for HootSuite and it gets better and better all the time. The best part about it, though, is the price tag. It’s free! This one’s just for the Gmail users. 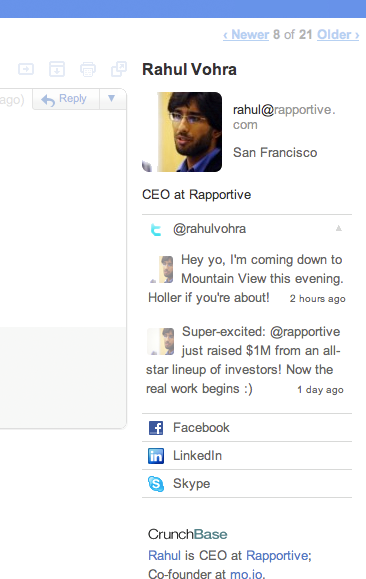 Rapportive is a Gmail plugin that takes over your right side column (no more ads!) and gives you information about the sender of the email. See screenshot to the right. 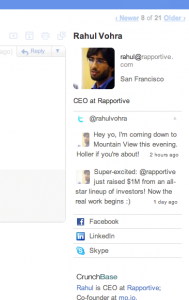 Rapportive adds a ton of insight that you might not have otherwise, and lets you find and follow your customers, vendors and prospects. You can also incorporate your own online database of customer information if you use Mailchimp or Batchbook – two other programs I use and love! Chelle Honiker-Yarbrough, CTC is the Director of TravelGeekSchool.com – an online learning center for travel professionals, offering courses and tips on Facebook, Twitter, LinkedIn, YouTube, Gmail, WordPress and other super-geeky tech stuff. Visit her website at www.travelgeekschool.com and follow her on Twitter @chelleyarbrough or http://facebook.com/travelwebmarketing. You can also catch her in person at this year’s Travel Institute Conference December 7th.